1. resistant to dogs on all four sides, as dogs have been known to try squeezing under, sliding over, and pushing in between previous barricades. As you can see, the current method of keeping the stupid dogs out of the vegetable plot is tomato cages stacked all over the place, which doesn't really work but is fine until tomatoes start showing up (at which point, all bets are off and the dogs will be through such a flimsy barrier). Anyway, this is a 4'x3' panel (plus a little, because of the frame). It's made from 2x4 stock, which has a slot cut into it. 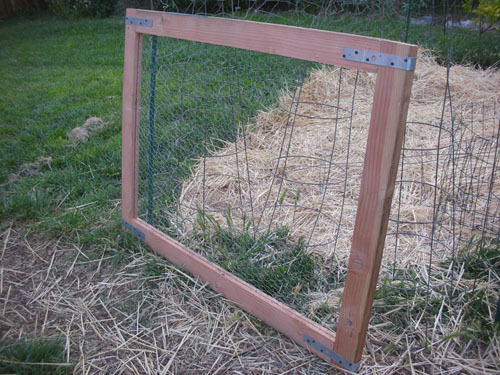 The chicken wire is secured in that slot with screws. The frame is held together with some metal straps, but it doesn't need much racking support as it will be held up on both ends. It seems like quite a nice construction, and I'm thinking of asking him to make me a chicken tractor along the same lines, so I can get the girls to work on weedy or snaily sections of the garden without having to be out there to make sure they don't devour other plants, or get out of the yard, or get eaten by a hawk. Neat! How do you cut the wire slot in the frame? The slot is cut by setting each piece of the frame on end and running it through a table saw. The blade cuts a blade-width slot through the wood, as deep as you have it set. In theory you can do the same with a circular saw, but everything ends up straight with a table saw.